Drafted by the San Diego Padres in the 4th round of the 2005 MLB June Amateur Draft, the Queens, New York native was able fulfill a dream when the Mets claimed him off of waivers in July of the 2011 season. He’s played parts of three seasons for the Mets where he hit .232/ .340/ .354/ .694 with four home runs, 22 doubles, 25 R.B.I.’s, and 46 runs scored. He had 406 plate appearances which translated to 345 at bats for the Orange & Blue. While his numbers by no means are overwhelming, he’ll be forever a hero in Queens for the part he played in one of the most historical games in the entirety of the New York Mets franchise. On June 1st, 2012 Mets Ace lefty Johan Santana took the mound against the St. Louis Cardinals and made history by throwing the franchise’s first “No Hitter”. While most no hitter’s involve a little bit of luck behind tremendous pitching, on that night, luck came in the form of Mike Baxter. 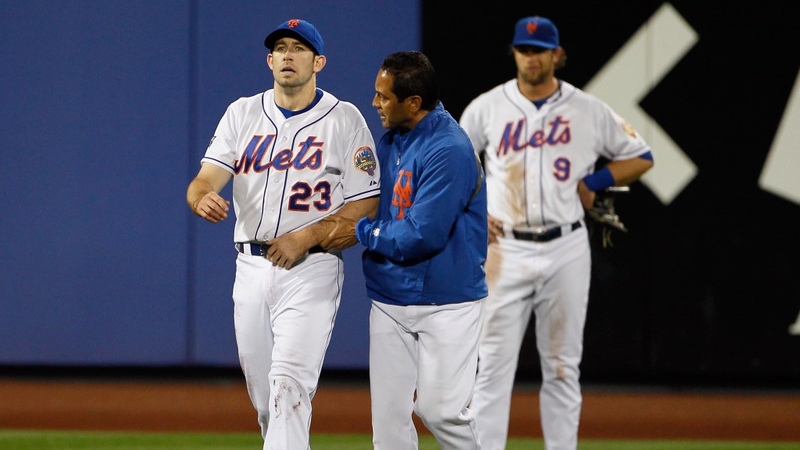 Amongst Mets fans, June 1st is referred to as “Johan Santana Day” and every Mets fan knows that there wouldn’t be a “Johan Santana Day” if it weren’t for the heroics of Mike Baxter and his “No Hitter” saving catch. A catch that fractured rib cartilage and caused displacement of his right collarbone.